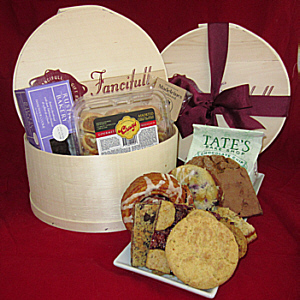 This basket is overflowing with mouth watering baked goods such as Chocolate Brownies, Coffee Cakes, Cookies, Bar Cookies(Apple, Peanutbutter and Apricot just to name just a few), Rugalach, Tate's Chocolate Chip Cookies and Rustic Bakery Chocolate Cocoa Nib Handmade Cookies which are in a class by themselves. There are approximately 43 pieces in the $73 version. From the Apple Bars to the Cinnamon Rolls everything here is top notch and guaranteed to please. Note: If shipping to the East Coast please select Three Day and ship on a Monday or Tuesday. Otherwise we can substitute something delicous in place of some of the more delicate items.